Call it an unreality show. 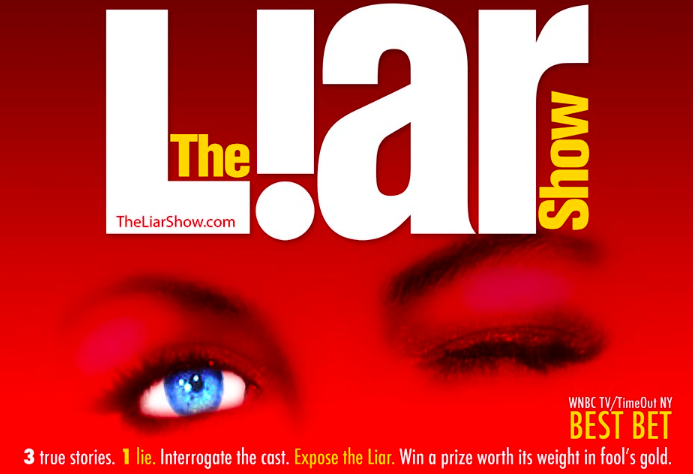 The Liar Show has taken the art of deception to theaters, cabarets and cultural centers around the U.S. and Canada and was called “A Winner” (The Scotsman) and received 4 Stars during a month-long run at the Edinburgh Fringe Festival. 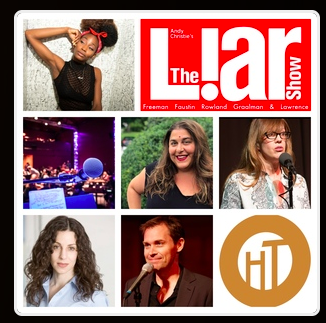 Liar has featured New Yorker Magazine contributor Andy Borowitz; Mike Daisey, called "The master storyteller" by the NY Times; and former Bill Clinton speechwriter Mark Katz, in addition to Comedy Central personalities, film directors, lapsed Mormons with a bone to pick with the Almighty and even an NYPD gang squad detective. Every Liar Show performance is unique. A constantly changing cast of writers and comics tell four short, extremely personal stories that will make you laugh, possibly make you think, and almost certainly make you glad you don't live with them. But listen closely, because only three of these people are telling the truth. The fourth is making it all up. After the stories have been told, all four performers return to the stage and defend their stories while the audience rakes them over the coals with a fact-finding question and answer session, refereed by the host. Each audience member casts a ballot and when the Liar is revealed, the perceptive geniuses who have guessed correctly walk away with aprize T-shirt amid a bitter chorus of "Congratulations, Einstein," from the empty-handed losers. This show will feature storytellers Cyndi Freeman, Marie Faustin, Tracy Rowland, Sarah Graalman and host Brad Lawrence. Brad Lawrence premiered his solo show, Monsters In The Wood, at the New York International Fringe Festival where he was awarded an extension at the festival’s close. He is a two-time Moth GrandSlam Champion and has been a guest performer for The Moth’s outreach program to schools and institutional communities. NY-based comedian and actress and one of the fastest rising talents on the comedy scene. She was a 2017 "New Face of Comedy" at the international Just For Laughs Comedy Festival in Montreal. Marie has appeared at Comedy Central's Clusterfest, GQ Magazine, MTV, MTV2, VH1, The BET Awards and TruTV. In 2016, Marie became the host of Oxygen's Very Real Talk. She's a regular feature in Time Out NY and is the on-air host of 99.5FM's "Tall Tales in the Big City." Marie also co-hosts the weekly podcast: The Unofficial Expert. Two-time NY Fringe Festival award-winning solo performer. Her solo shows have been presented in New York, Boston, Amsterdam, Ireland, London, Edinburgh and Edmonton, Alberta. Ms. Freeman is a recipient of a grand prize playwriting fellowship award from the Massachusetts Cultural Council. Her performing credits include HBO, Showtime, The Colbert Report on Comedy Central and storytelling shows Stories From The Stage, The Moth and RISK! As a teacher, Ms. Freeman is a lead instructor with The Story Studio, The Moth Community program, and she is a story coach for the RISK! podcast. A three-time Moth SLAM champion, and a regular on The Liar Show. In her day job as an Emmy Award-winning TV lady, Tracy was part of the creative teams that brought Cartoon Network to Asia, and Al Jazeera to America. She is a firm believer trade balance. Sarah Graalman is a writer, performer, and makeup artist who lives in Brooklyn and hails from Oklahoma. As a makeupartist she’s worked over a decade in fashion, print, theater, and television, recently completing her 3rd season running the makeup department for High Maintenance on HBO. Shes performed many original stories many places, and currently is writing a book about women and their relationship to makeup, beauty rituals, and vanity.